Let there be light. Your customizable LED flash facial. One device, 5 benefits - Repair, Glow, Soothe, Optimize and V-Sculpt. 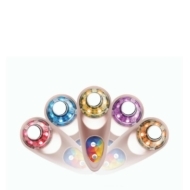 The Optimizer Voyage Tri-Light++ combines the power of NASA-inspired LED Chromotherapy and Low Frequency Stimulation to tackle multiple skin concerns for younger looking, brighter and blemish-free skin. In addition to the original 3 targeted LED lights (Red, Blue, Yellow), the Optimizer Voyage Tri-Light++ features 2 new power combo lights (Orange & Purple), which deliver twice the benefits in the same amount of time. REPAIR with the Red Light - Renew and repair damaged skin cells. Increase collagen and elastin production. GLOW with the Yellow Light - Revive dull skin for a brighter complexion and reduce the appearance of scars and dark spots. SOOTHE with the Blue Light - Alleviate acne, oily or congested skin and calm skin sensitivity. GLOW & REPAIR with the power combo Orange Light - Combines the benefits of Yellow and Red Lights to tackle pigmentation, dullness, fine lines and wrinkles. 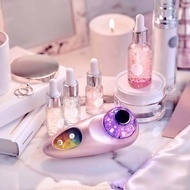 REPAIR & SOOTHE with the power combo Purple Light - Combines the benefits of Red and Blue Lights to alleviate sensitivity or adult acne and aging concerns. Optimize - Boost absorption of active ingredients in skincare products. V-Sculpt - Achieve lifted V-shape facial contour and reduce water retention. The Optimizer Voyage Tri-Light should be used with water-based products and we recommend using it with Skin Inc serums and Pure Deepsea Hydrating Mask or Facial In A Flash Hydrogel Masks for best results.